2016 has been considered as the base year for company profiles. In cases, wherein information was unavailable for the base year, the year to it has been considered. Various secondary sources such as company websites, encyclopedias, directories, and databases, such as Bloomberg, Factiva, and Polymer Database, have been used to understand and gain insights into the itaconic acid market. Experts from top companies in the market have been interviewed to verify and collect critical information and assess trends in the itaconic acid market during the forecast period. Top-down, bottom-up, and data triangulation approaches have been implemented to calculate the exact values of the sizes of the overall parent and individual markets. The itaconic acid market has a diversified ecosystem, which includes downstream stakeholders, such as manufacturers, vendors, and end users of itaconic acid as well as various government organizations. The value chain of the itaconic acid market includes manufacturers, such as Itaconix Corporation (UK), Alpha Chemika (India), Qingdao Langyatai (China), etc. Manufacturers of itaconic acid supply their products to various end-use industries, such as paper coating, paper processing, skin care, detergent, medical equipment, etc. This research report categorizes the itaconic acid market based on derivative, application, and region. It forecasts revenue growth and analyzes trends in each of the sub-markets till 2022. 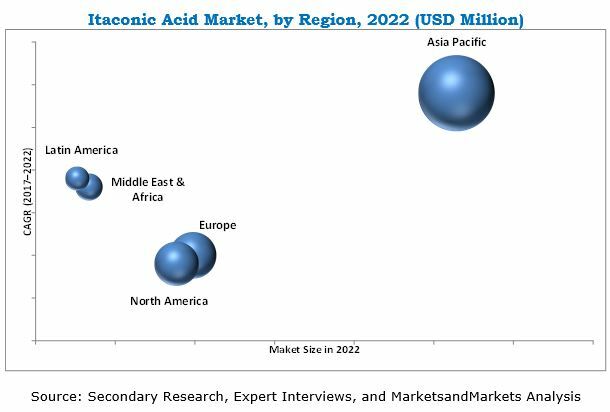 The itaconic acid market is projected to grow from USD 83.8 Million in 2017 to USD 102.3 Million by 2022, at a CAGR of 4.1% from 2017 to 2022. The increasing demand for bio-based unsaturated polyester resin and its non-toxic properties are fueling the growth of the itaconic acid market across the globe. The itaconic acid market has been segmented based on derivative into styrene butadiene itaconic acid, methyl methacrylate, polyitaconic acid, and others. Styrene butadiene itaconic acid offers an excellent bond, improved tensile strength, frothing machinability & binder strength, and possesses and flexural and anti-oxidation properties. This results in smoothness, glossy finish, and reduction in the use of expensive coating color additives, making them useful in various applications such as paper processing, paper coating, carpet backing, and non-woven applications. These are some of the factors that are expected to drive the demand for itaconic acid between 2017 and 2022. Based on application, the itaconic acid market has been segmented into SBR latex, synthetic latex, chillant dispersant agents, superabsorbent polymers, and others. The superabsorbent polymers application segment of the itaconic acid market is projected to grow at the highest CAGR during the forecast period. Itaconic acid-based superabsorbent polymers are used in detergents and skin care, cosmetics, personal care, and hygiene care industries. Various properties of itaconic acid are expected to increase its use in these applications, thus increasing its demand between 2017 and 2022. The Asia Pacific itaconic acid market is projected to grow at the highest CAGR from 2017 to 2022. The growth of the Asia Pacific itaconic acid market can be attributed to the increasing demand for itaconic acid from countries such China, India, South Korea, Thailand, and Indonesia, among others, for use in various applications. Moreover, increasing FDI in various industries in these economies is also contributing to the growth of the Asia Pacific itaconic acid market. Itaconix Corporation (UK), Qingdao Langyatai (China), Zhejiang Guoguang (China), Alpha Chemika (India), Shandong Kaison (China), Jinan Huaming (China), Iwata Chemical (Japan), Aekyung Petrochemical (South Korea), Ronas Chemical (China), and Chengdu Jinkai (China) are some of the leading players operating in the itaconic acid market. 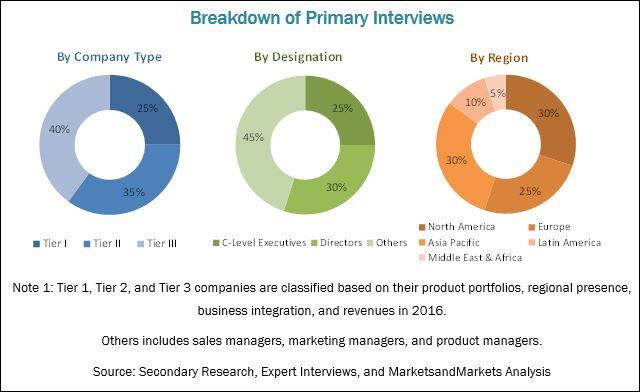 These players have been adopting various organic and inorganic growth strategies such as agreements, acquisitions, joint ventures, and expansions to enhance their market shares in the itaconic acid market. 11.2 Qingdao Langyatai Group Co., Ltd.
11.3 Zhejiang Guoguang Biochemistry Co., Ltd.
11.4 Jinan Huaming Biochemistry Co. Ltd.
11.5 Iwata Chemical Co., Ltd.
11.7 Shandong Kaison Biochemical Co., Ltd.
11.8 Aekyung Petrochemical Co. Ltd.
11.9 Chengdu Jinkai Biology Engineering Co., Ltd.
11.10 Ronas Chemicals Ind. Co., Ltd.
11.11.3 Shandong Zhongshun Science & Technology Development Co., Ltd.
11.11.4 Nanjing Huajin Healthcare Biologicals Co. Ltd.
11.11.5 Ultimate Chem India Pvt. Ltd.